Windows are an important part of any home. Windows give a home light and space that allows homes to feel more open and bright. Can windows make homes more energy efficient. We often overlook windows when talking about energy saving upgrades for the home. Moat assume that windows are all the same , large or small, they just keep out the outside. But windows can do so much more. Windows can create so much insulation when done well. Insulation in your window can make a large difference when your heating or cooling your home or office in the peak seasons. If you would like to see what changes you can make when it comes to your windows and the quality of them, contact Allan Low Glass to explore some of our popular glazing services. Double glazed windows are a window system that includes two glass panes with a layer of inert gas in between. The space between the glass creates an energy efficient insulation for your home or business. They also offer a bit of a sound barrier as well. These windows can be better than a basic single pane window. Especially in older homes that lack proper insulation to keep heating and cooling techniques efficient. Glass glazing is done to create a tight barrier in windows to create a air tight and protect against condensation that can build up on either side of the glass of a single pane window. 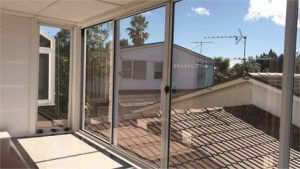 There are several ways to achieve glass glazing whatever your home or business needs may be. Newer homes can have double glazed windows installed from the beginning as to create an energy efficient insulation for your new home. In older homes a retrofit double glazing service can replace single pane windows which are not as energy efficient. Older homes can be so beautiful and full of character and charm. But getting your windows up to par can be a task when remodeling a older home.Retrofit double glazing is replacing old single glass pane windows with double glazed windows. This is a great option in older homes that may only have older windows that are not energy efficient. Allan Low Glass can do window glazing customized for the purpose of your building. We custom create window glazing solutions to match the existing colors and materials of your home and business. We are up to the challenge of making your windows not only beautiful but efficient for your home. Our retrofit double glazing can allow you to take control of the insulation of your space. No longer do you need to worry about losing money because of heating and cooling lost through single pane windows. We boost the insulation of your home and save you in energy cost. Allan Low Glass is a customer satisfaction first company, and we pride ourselves on the growth we have made with our customers. We want you to know that you as a customer are our number one priority. Allan Low Glass gives quality work and friendly service. We deliver the best service that you recommend to your friends and businesses over and over again. We know we are the best in glass. Reputation- our reputation can’t be beat. We do everything to ensure your satisfied with our work. We take great pride in our high customer service and know that’s why you recommend us to your friends and neighbors. Professionals- our trained glass expert’s have the experience and expertise to handle any window job with ease. Rest assured that with allan low glass you are in good hands. Prices – we offer the best quality service and hardware at fair unbeatable prices. We aim to satisfy all your window needs without breaking the bank. Call us for a quote in your double glazing windows. Trust us to give you a fair and honest price for the work. Rest assured that the double glazed windows will be installed by skilled expert professionals using the highest grade materials and tools. We take pride in helping you to transition old windows with retrofit window glazing service. We help to make your home more energy efficient. Let Allan Low Glass show you why we are number one in customer satisfaction. No matter what your glass glazing needs may be Allan Low Glass has you covered. Double glazing will help to keep your home warm in the winter and cool in the summer. Double glazing needs to be installed properly, however, it needs to be manufactured to the highest standards, and the materials used must be high-quality. To get all these things, you need Allan Low Glazing. We have extensive experience installing double glaze and have an enviable reputation for quality in the industry. This means you can expect excellent workmanship and attention to detail. The result will be double glaze that delivers all the promised benefits and that is built to last. Our double glazing services will not only give you a more energy efficient window solution, they will also enhance the appearance of your home with brand new window frames. We have a number of window frame options to choose from including different colours and styles. There are also a number of glass options to choose from depending on your budget and the features you want. This includes specialist options including window tinting, soundproof options, toughened glass, and more. Do want to keep your existing window frames but want to replace the single glazed glass with double glazing? Our retrofit double-glazing services are the ideal solution. Our team has extensive experience developing and installing retrofit double-glazing solutions for a range of home and window frame styles. Once the work is finished, you will have all the benefits of double glazing, including reduced energy bills and improved comfort, while at the same time keeping the visual appearance of your home. To get a free, no-obligation quote for new or retrofit double glazing, please contact us today by calling 06 758 1444.